"Do you have a large collection of valuable watches and jewelry? Do you have paper work that if compromised will give access to your identity? If so these AmSec Amvault TL-30 safes are for you. Their extra security goes a long way in protecting your valuables." These TL-30 safes have gone through extreme tests to prove their ability to keep the burglar out and your valuables in. The U.L. experts used all types of tools such as sledgehammers, power saws, carbide disc cutters, drills and other tools. They were awarded the U.L. TL-30 label, which signifies that the safe offers a moderate degree of protection against attack by common mechanical and electrical hand tools. The construction requirements are: a UL listed group II, 1 or 1r combination lock must be used, the safe must weigh 750 pounds minimum (or come with instructions on how to anchor into a larger safe, concrete blocks or on the premises where used). 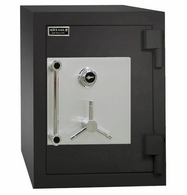 The body walls of the safe must be equivalent to at least one inch open hearth steel with a minimum tensile strength of 50,000 P.S.I. The walls must be fastened in a manner equivalent to continuous 1/4-inch penetration weld of open hearth steel with minimum tinsel strength of 50,000 P.S.I. It must have a one 1/4 inch or less hole to accommodate electrical conductors arranged to have no direct view of the door or locking mechanisms. It must successfully resist entry for a net working time of 30 minutes when attacked with common hand tools, picking tools, mechanical or portable electric tools, grinding points, carbide drills and pressure applying devices or mechanisms, abrasive cutting wheels and power saws. That's a lot of different ways to try to break into a safe! 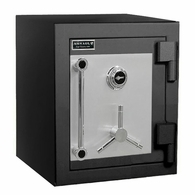 The AmSec TL-30 composite safe qualifies for Mercantile & Broadform Insurance Class F with a Bank Rating of G. As well as the burglary rating, these safes carry a two hour class 350°F manufacturers fire label. Standard color is parchment, with other colors available upon request. 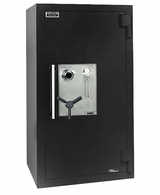 Good for commercial applications as well as residential uses when you have an expensive collection to protect, the Amvault high security composite safes by Amsec will certainly stand up to the job.